Junior guard Leila Copeland was fantastic in the first quarter, with 11 points and five rebounds. With the Liberty regular season title on the line Tuesday night at McLean, Leila Copeland and the South Lakes Seahawks came ready to play. South Lakes raced to an early 12-0 lead and held on to defeat the Highlanders, 64-56. Copeland was unbelievable early. The junior guard just seemed to be playing at a different speed as she registered 11 points, five rebounds, two assists in the first quarter. She was everywhere on defense, getting steal after steal, and although the other Seahawks played well her energy clearly served as the catalyst for the Seahawks. The motivation showed. After a time out McLean was able to weather the initial South Lakes run, but still trailed 24-11 after a period. The Highlanders received new life when Copeland picked up her second foul with 3:55 left in the second quarter. Copeland went to the bench and the Seahawks lost their intensity with McLean closing the quarter on a 12-0 run. Despite the strong start from the Seahawks, McLean now only trailed by two at halftime with the game very much up in the air. South Lakes then opened the third quarter almost as strong as it did the first. Copeland again sparked the Seahawks, and sophomore forward Brianna Scott started to assert herself as well. The tallest player on the court, Scott not only started to control the boards but find her shot. She was efficient from both inside and outside the arc, and the Seahawks out-scored McLean 21-12 in the third quarter. Brianna Scott finished with 17 points, 10 boards and was tough inside and out. McLean didn’t quit, but the Highlanders may have been a little taxed from a nice comeback win over a tough Herndon team the night before. 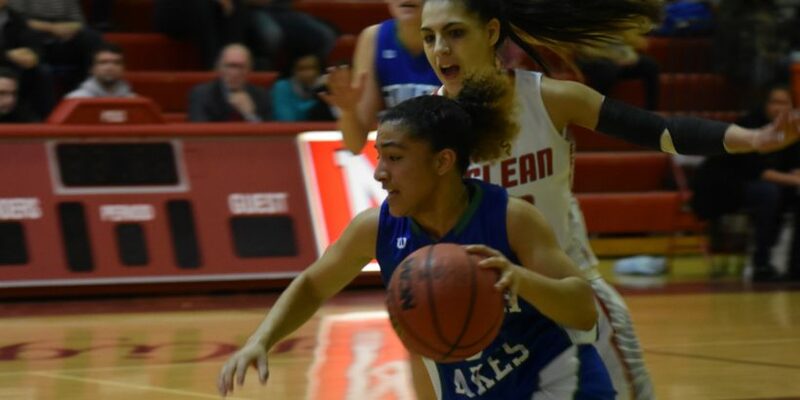 McLean cut the Seahawks lead to seven in the fourth quarter on a few occasions, once to 56-49 when junior guard Elizabeth Dufrane buried a three. The very next possession, however, Copeland buried a nice floating lay-up and McLean never got any closer. Copeland, an ultra-quick point guard, was also key in killing clock the rest of the way and keeping the ball away from McLean. 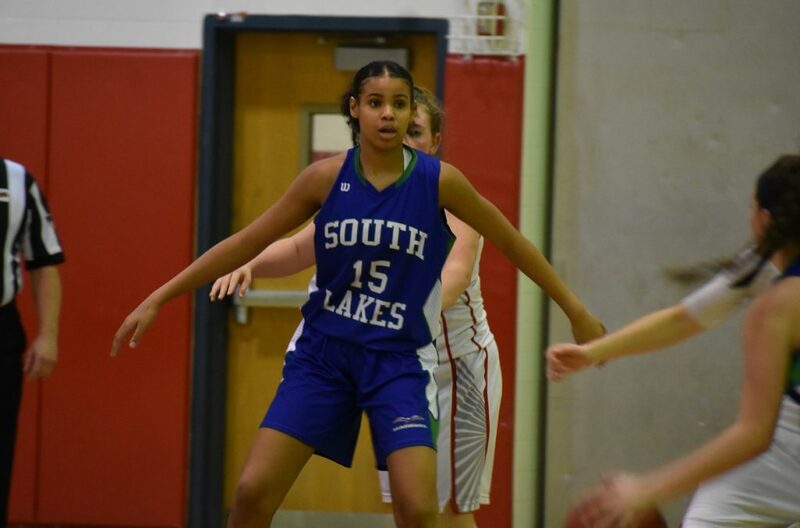 Copeland finished with 24 points and five assists on the night for South Lakes (7-2, 17-4), now a game up on McLean in the Liberty standings with one to play. 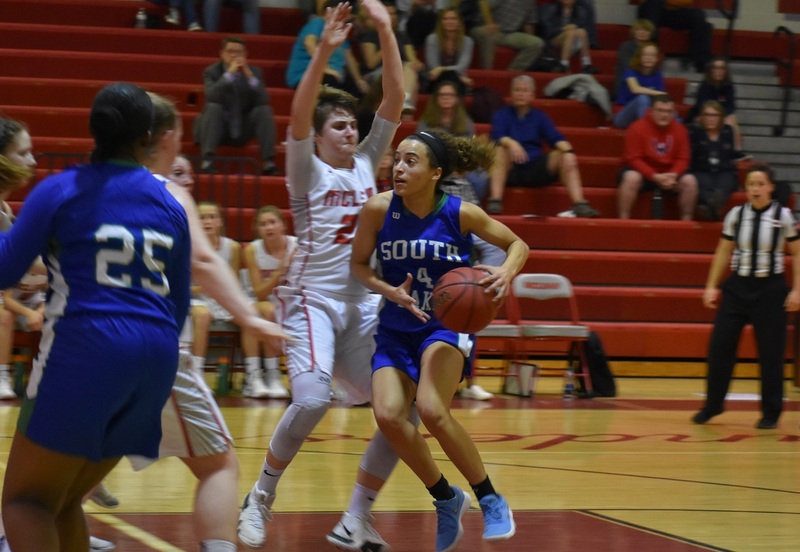 Scott added 17 points and 10 rebounds for South Lakes, which swept the season series from the Highlanders so is assured of the top seed in the Liberty Tournament. The other Seahawk starters did a good job as well. Junior guard Margo Somer hit some nice perimeter shots, especially in the first quarter, and finished with 12 points. Junior guard Nina Boffman added nine points, while senior Olivia Nielsen added eight rebounds. South Lakes’ Nina Boffman (nine points) jump-stops into the lane. The outstanding backcourt of Dufrane and senior Mariane Auza powered McLean (6-3, 15-6), with the duo combining for 28 points. Still, Auza ended up fouling out and Dufrane found it difficult to get in any kind of scoring rhythm most of the night. To her credit she responded to extra defensive attention from South Lakes well, registering four assists to her teammates. Sophomore forward Sophia Smith had nine points off the bench for the Highlanders. There’s not much time to celebrate for South Lakes with a regular season game still outstanding and the Liberty Tournament coming up. A McLean-South Lakes rematch is certainly possible there, although there are plenty of other good teams that could spoil that. To that end we asked Copeland what her team has to do to be successful in the Liberty Tournament and at regionals.